all the skiers/snowboarders must read the followings and fully understand the dangers. The object of these rules is to contribute to the sound development of snow sports by determining the unified rules between skiers/snowboarders and the ski resort management in the ski resort, and prevent any skiing related accidents by urging both parties to follow the rules. Snow sports can be enjoyed freely by anyone but is always fraught with dangers. Guests must ski at their own responsibility. There are following immanent dangers in snow sports. ・Dangers due to land features such as cliffs, steep slopes, ditches and creeks. ・Dangers due to the condition of snow and snow surface such as frozen surface, deep snow, crevasses, avalanches as well as tree wells and tree holes. ・Dangers due to natural objects such as trees, tree stumps, bush, rocks, exposed ground surface and waterways. ・Skiing/Snowboarding outside the courses set by the ski resort. Before skiing in deep snow, skiers must take off the straps on the poles in order to secure breathing space in case you are buried in snow. Also, skiers/snowboarders must not run near big trees so as not to fall into tree wells. 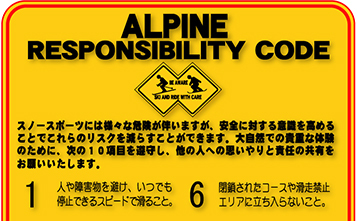 ・When an accident happened, all the skiers/snowboarders must help to rescue people involved. ・People involved in accidents as well as witnesses of the accident must inform the situation to Ski Patrol or ski resort staff without delay, and help the injured. ・People involved in accidents as well as witnesses of the accident must accurately inform the situation and identify yourself to Ski Patrol, ski resort staff and other related people. 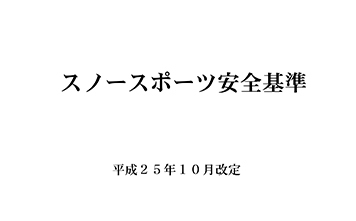 ・If an accident was happened outside the courses or at unmanaged area by those who ignored the regulations of the ski resort and entered such area, all the search and rescue expenses are met at the skiers/snowboarders responsibility. When skiers/snowboarders sue a ski resort for a ski accident at court, in most of cases, they do so by the reason of “Liability of Possessor and Owner of Structure on Land” in the Civil Code (Article 717). However, as the safety measure of ski resort is set on the assumption that skiers/snowboarders follow the rules in the measure, ski resort is not liable for any accidents caused by skiers/snowboarders who did not observe those rules. Due to changes in the circumstances of Snow Sports, this clarifies the Safety Code that states the responsibilities of skiers, snowboarders and snow resorts respectively. The unified rules of 3 ski resorts in Otari Village for safety and security of snow sports. Beacon, Shovel, Sonde, Backpack, Snowshoes, Poles, etc. Above are goods that should, at minimum, be equipped for backcountry skiing/snowboarding.